Bali’s most popular dive site, the USS Liberty shipwreck is known to divers around the world as one of the easiest large wrecks to access. It lies just off the shore of Tulamben, near Amed, at a maximum depth of around 100 feet (30 meters). Marine life from turtles to flashing clams are common on the wreck. While Tulamben and Amed are the nearest towns to the site, dive schools run USS Liberty day trips from Sanur, Ubud, and all over south Bali, most offering door-to-door transfers. The Liberty wreck is suitable for both advanced and open-water qualified divers. Great visibility for most of the year means it’s also a popular location for Discover Scuba Dive experiences, enabling would-be divers to experience the underwater world without committing to a multi-day course. As the top of the wreck lies just a few feet below the surface of the water, USS Liberty snorkel trips are also a popular choice. The USS Liberty wreck is a bucket-list dive for scuba divers visiting Bali. Bali dive packages typically include all dive gear, with the exception of a computer. The USS Liberty site is just one of many dive sites around Amed and Tulamben. Many divers choose to spend several days in the area. The Liberty shipwreck is a shore dive with limited current, making it popular with beginner divers. The USS Liberty wreck lies just off the shore of Tulamben in east Bali, around three hours’ drive from Kuta. While many tourists stay either in Tulamben or nearby Amed to dive the wreck and the area’s other fascinating dive sites, those who are short on time will find it easiest to book a day trip from south Bali rather than explore the area in full. It’s possible to dive the Liberty year-round, but between roughly December and March, the peak of the rainy season can mean plastic garbage in the water and reduced visibility. Throughout the year, the site gets very, very crowded, particularly at shallower depths. To beat the crowds, dive early, and dive deep. The USAT (United States Army Transport) Liberty was a US cargo ship during World War I. During World War II, the USS Liberty was torpedoed by the Japanese in 1942 while en route from Australia to defend the Philippines. She was beached on Bali’s east coast so that her cargo could be salvaged, but slipped into the ocean during the eruption of Mt. Agung in the 1960s. Whether you’ve never scuba dived before or have quite a few dives under your belt, the USS Liberty shipwreck at Tulamben is one of Bali’s underwater highlights. Discover the spectacular marine life that flourishes on this World War II–era wreck on two short dives accompanied by a PADI-certified instructor. Upgrade to include round-trip transfers from other parts of Bali. Head to Tulamben, one of Bali's most beautiful diving locations, to learn the basics of scuba diving. Once you're comfortable, head to the shallow around Suci Place, where several statues of Hindu gods rest under the surface, before continuing on to the USS Liberty Shipwreck. After a delicious lunch, head to the Water Palace and Goa Lawah Temple on your way back to your accommodation. Tulamben was a very anonymous fishing village in the dry lands of Karangasem for a very long period. Nowadays, it’s the busiest diving destination in Bali. Since the discovery of the USS Liberty as a diving destination back in the 1980’ies, USS Liberty Shipwreck • Type: Shore Dive • Level: All Levels • Current: None • Depth: 10 - 30 meters This is the most famous dive site in Bali. The USS Liberty Shipwreck is a 120 meter long shipwreck just 50 meters off the shore in Tulamben. It lies between 10 and 30 meters, with a small part a bit more shallow. This dive site has everything for everyone. It is the easiest wreck dive in the world. The Liberty is covered with coral and has an abundance of fish life around it. Explore the fascinating depths of the ocean on a full-day PADI beginner scuba diving course in Tulamben from select Bali locations. On arrival in Tulamben, you’ll greet your experienced diving instructor and learn basic techniques required to dive. Without any prior experience of diving, you’ll descend to a depth of 40 feet (12 meters) to see an intriguing underwater world replete with coral and diverse marine life. Scour the sea for sightings of turtles, sharks, squid and eels before returning to dry land and opting to purchase memorable souvenir photographs. Take the plunge for a fun-filled day of scuba diving on the shipwreck of the USAT Liberty during this 10.5-hour PADI-certified excursion. Participate in two dives during your trip, starting with a shorter dive to experience congregations of reef fish, turtles, eels, black-tipped sharks, shrimp and more. After an included lunch, take your second afternoon dive on this historic 393-foot (120-meter) long shipwreck, sunk back in 1963. A professional guide, lunch, beverages, all equipment and round-trip hotel transport are included. Please note this diving experience is for certified divers with any level of experience. You must have proof of certification that you have dived before. Want to see a shipwreck but don't know how to scuba dive? Don't fret. With this tour, you'll get to snorkel around the USS Liberty Shipwreck in Eastern Bali, all with the guidance of a PADI certified instructor. After exploring the sunken ship, you'll stop to clean up and dine on a Balinese lunch before returning to your hotel. This the perfect activity for those who put so much interested in underwater photography. The Wreck Dive will take you to numerous sites for diving. Each site will guarantee you the breathtaking view of marine ecosystem. It doesn’t matter if you are a beginner or an expert diver. The packages are available for both licensed-diver and non-licensed-diver. Snorkeling and seeing the coral reefs and fish might sound usual. What if you can spectate more than that when you joining this tour? Something that you will see right after you jump into water is definitely beyond your imagination. Meet the famous shipwreck of USAT Liberty, a cargo ship of US army which sunk thousand years ago. The shipwreck is extremely breathtaking with the combination of underwater scenery. With the help of guide, equipment, lunch, and the ease of pickup service, the tour is perfect to meet your needs in discovering what's hidden under the waves! 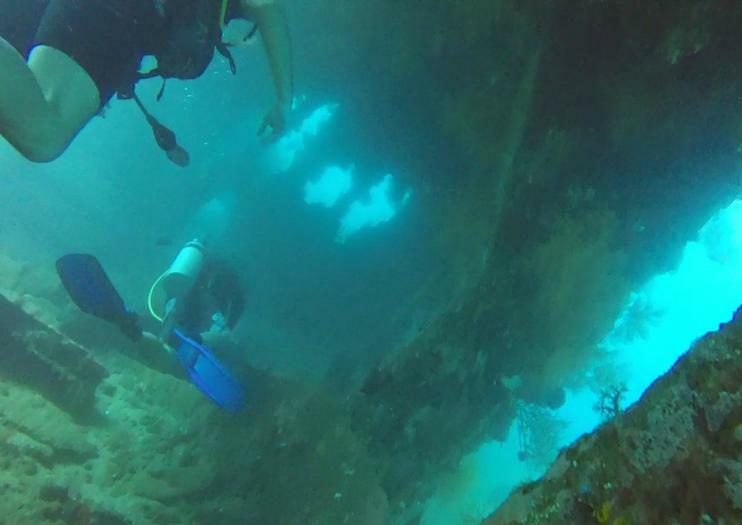 Explore the USS Liberty shipwreck on a full-day scuba excursion from Bali. Complimentary transportation from your hotel takes you to Tulamben. After an orientation, get fitted in provided gear and safety equipment. The dive site is one of the easiest shipwrecks to explore in the world. Covered in coral and surrounded by sea life, you’re sure to enjoy this (literally) immersive experience. Between the two 35-minute dives, enjoy a Balinese lunch.